Promising only a good type of cholesterol attack, this moody ramen house stakes its name on a fatty tonkotsu broth, perfectly al dente noodles and sinful slow-cooked chashu. The menu lists page upon page of steaming hot bowls (plus karaage, rice bowls and other Japanese greatest hits), but we’ll save you the effort: order the Kakuni Bankara for three-day-braised pork belly that actually melts in your mouth. The Manor, 32/1 Sukhumvit Soi 39, 02-622-5162/3. Open daily 11am-11pm. Other branches: Siam Paragon, Zpell. Three-time ramen TV Champion chef Shigemi Kawahara, from Fukuoka, came to Bangkok in splendid style when he launched Ippudo at Central Embassy in 2013, and has since expanded around the city. The original venue places chef Shigemi’s three Hakata-derived tonkotsu ramen styles in a grand setting of kanji calligraphy screens and black-onred decor—more high-end clothing store than ramen joint. 3/F, Central Embassy, Phloen Chit Rd., 02-160-5672. BTS Phloen Chit. Open daily 10am-10pm. 9 other branches across Bangkok. Back in Japan, this ramen spot boasts wildly popular branches where near-permanent queues snake outside. You won’t find quite the same hordes of people here in Bangkok, but you will find deliciously bold flavors in the signature “zenburi” ramen, which comes loaded with great big chunks of braised pork, a boiled egg and a dollop of salty, marinated cod roe. 1/F, Park Ventures Ecoplex, 57 Wireless Rd., 096 989 1104. Open daily 11am-10pm. This minimalist, light wood affair is about as zen as a ramen venture gets. The specialty is a seafood and chicken broth that’s smoother and less oily than ubiquitous tonkotsu version, though the Noko Gyokai ramen should appease even the staunchest pork-bone aficionado. What else stands out here are the two sizes of freshly made noodles and the incredibly tender trio of sous-vide meat toppings (chicken, pork belly and pork shoulder). LG/F, Erawan, 494 Phloen Chit Rd., 02-250-7669. Open daily 11:30am-3:30pm, 6-9pm. This creamy, earthy ramen hails from Sanuki prefecture in Ibaraki and comes to Bangkok courtesy of a globe-trotting chef with openings in the US, Canada, the Philippines and Singapore. The dark and moody setting invites solo diners to wolf down guilty, cholesterol-fueled bowls free from judgement. Popular vote goes to the Special Ramen with its molten pork fat, slow-cooked pork-belly chashu and a boiled egg with a perfectly fudgy yolk. 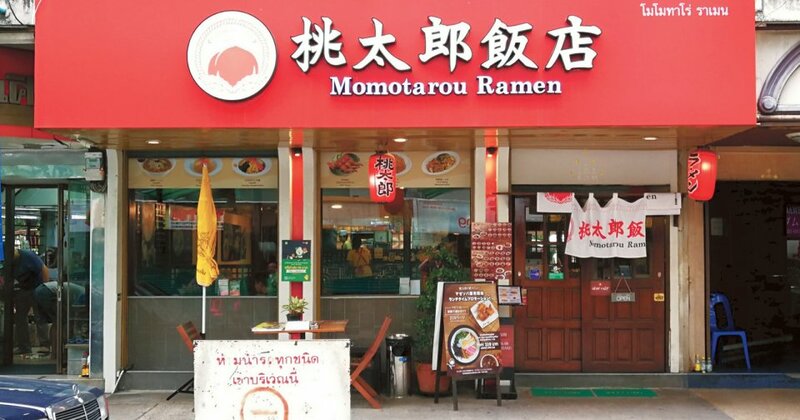 Nihonmura Mall, Thonglor soi 13, 02-185-2457. Open Mon-Fri 11:30am-2:30pm, 5:30- 10:30pm; Sat-Sun 11:30am-10:30pm. Tucked away in Isetan department store’s 88 Shokudo Nippon food court, this counter from the Tokyo cult favorite serves a simple line of steaming tonkotsu ramen. Featuring a soup base that’s creamier than most, Menya Musashi’s bowls come in white, red and black versions. The tsukemen (dipping ramen) is spectacular, featuring chunks of melt-in-your-mouth pork, perfectly chewy noodles and a dense, slurp-worthy soup. 5/F, Isetan, Ratchadamri Rd., 02-613-1074. BTS Chit Lom. Open daily 10.30am-9pm. It takes 10 hours of simmering and a bunch of whole chickens to make Menya Takeichi’s thick soup. 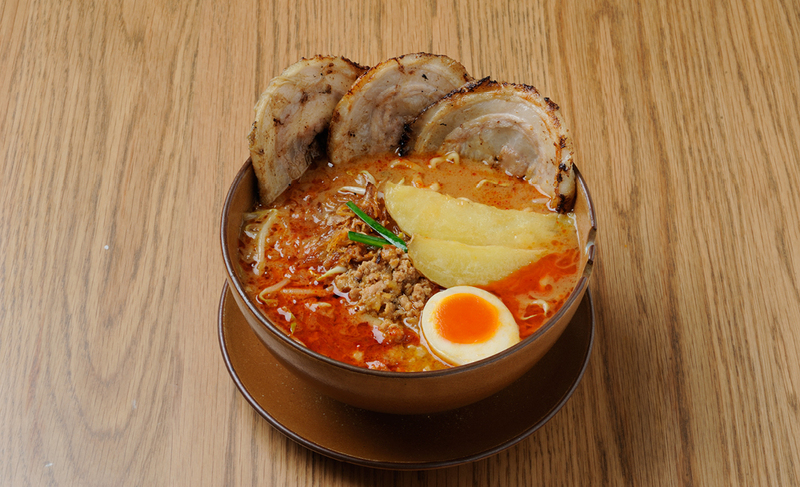 You won't find the usual tonkotsu pork ramen here—this chain is regularly lauded as one of Tokyo's top names for chicken ramen and has spread to Singapore before arriving in Bangkok. Choose from shoyu (soy sauce), shio (salt) or spicy sauce to go with the soup and tuck into the tender slow-cooked chicken breast chashu. Also try the deboned chicken wing karaage and rice ball with fried chicken. 2/F, K Village, Sukhumvit Soi 26, 02-259-9300. Open daily 11am-10pm. This ramen chain is now an empire that stretches from Los Angles to Sao Paulo--and throughout Japan, of course. They have the usual thick pork bone broths and slices of fatty char siu but Misoya also serves healthy, vegetarian alternatives that tap into the therapeutic qualities of miso. You should also look out for their specials, which can range from tom yam with miso to Hokkaido snow cheese toppings. 7/F, EmQuartier, Sukhumvit Rd., 089-053-7474. Open daily 11am-10pm. BTS Phrom Phong. For years, the restaurant hid behind a rickety wooden door without so much as a menu outside, barely noticeable amid the Thaniya lunch chaos. Today, it bears the marks of a typical attention-grabbing Thaniya dive—bright red signage, menus out front and waitresses beckoning you inside. 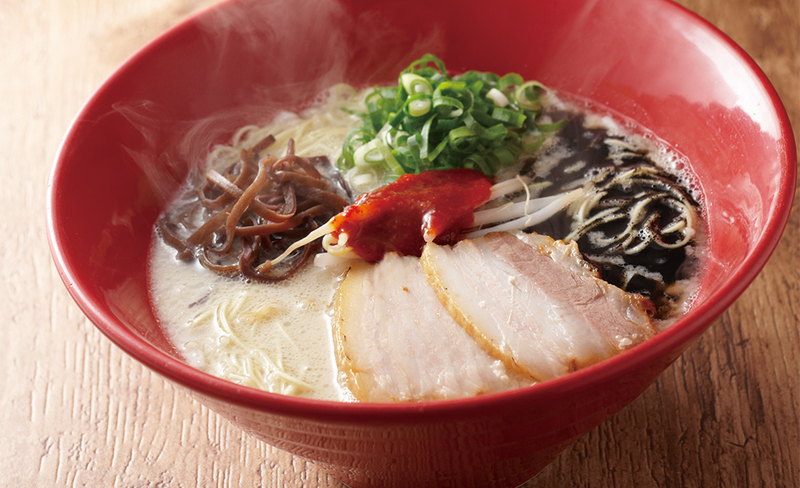 First-timers should start with the restaurant’s best, a steaming bowl of savory chashumen (shoyu ramen with pork belly. With 5-6 slices of tender, thick-cut pork inside each bowl, it’s an all-you-need-to-order portion that blows plenty of competitors out of the water. The piping hot, flavorful broth deserves a nod as a hangover destroyer, too. 19-21 Soi Thaniya, 02-235-0108. Open daily 11am-2am. BTS Sala Daeng. 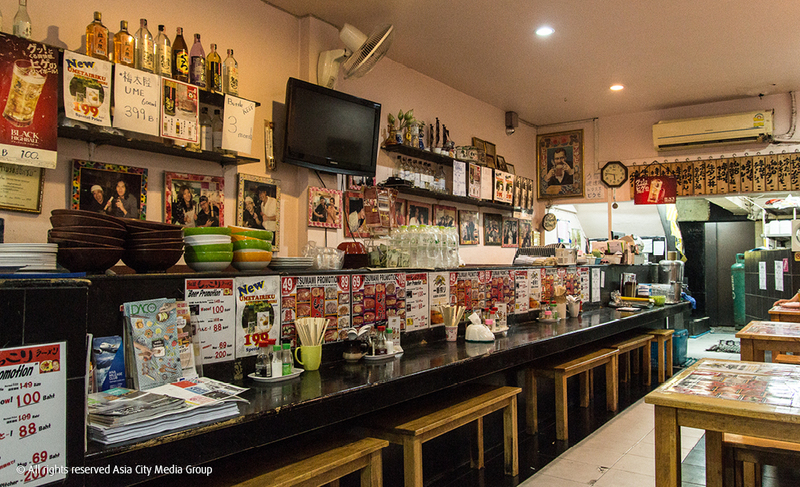 Doesn’t matter which of the five branches you stumble into, you’re guaranteed to be greeted like an old, drunken friend at this old-school Japanese diner. Whether your preference is syoyu, miso or tonkotsu, the bowls here are big on flavor and portion. Special mention goes to the katsu curry, which is a buttery delight. The sets are big enough to feed a small family—or just one very hungry Japanese salaryman. Piman 49 Complex, 46/14 Sukhumvit Soi 49, 02-260-7786-7. Open daily 11am-11pm. 4 other branches across Bangkok. 8/3 Thonglor Soi 2, 02-392-0811. Open daily 11am-2am. Other branch: Surawong. 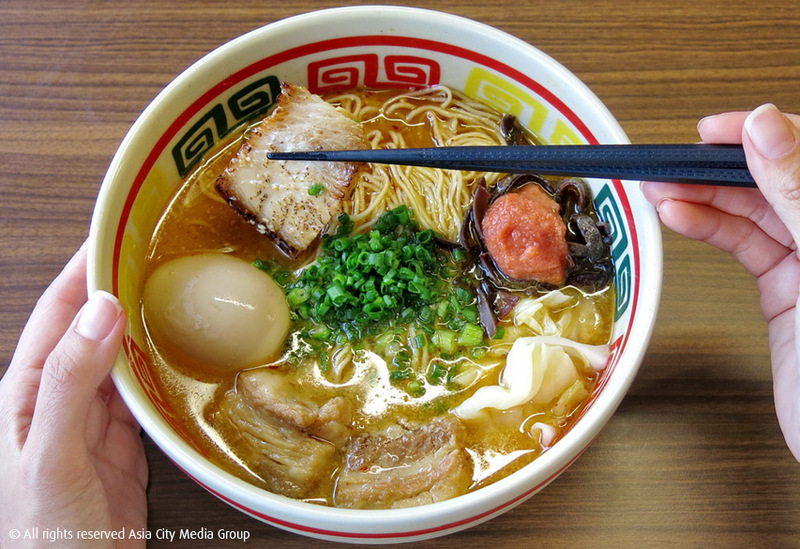 This 60-year-old Fukuoka name is best known for its rich, Hakata-style ramen broth and chashu that’s the appealing type of fatty. The ramen’s complemented by a large selection of kushiyaki (grilled skewers) and insanely good gyoza. A mid-week visit will find the dining room filled wall-to-wall with Japanese expats. 39/1 Sukhumvit Soi 23, 02-664-1130. Open Mon-Fri 11:30am-14:30, 5:30-midnight; Sat 11:30am-midnight; Sun 11:30am-10pm. Other branches: Silom, The Commons. This Japanese chain serves Kyushu-style ramen, the secret of which is a deliciously thick broth that rivals even the fattiest kha muu (with ten times more salt). 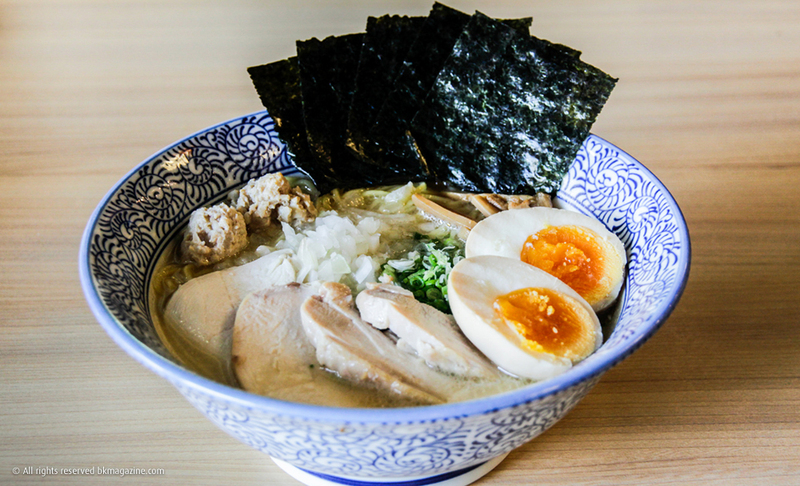 In the signature Yamagoya Ramen, added to that soup are toothsome noodles, slices of fatty pork, hard-boiled eggs, chopped green onion, tender bamboo, seaweed and pickled ginger. 98-102 Surawong Rd., 02-637-0588. MRT Sam Yan. Open daily 10:30am-10pm. 4 other branches across Bangkok.